For those who love history and who would rather ride than drive, Old Town Trolley Tours of San Diego is an excellent option. The guides are knowledgeable, entertaining historians that have all the answers to your questions about things to do in San Diego. The San Diego Tour has 10 stops and allows you to get off, hang out as long as you want, and then get back on when another trolley comes along. So you can ride on the trolley – which is open and breezy, and visit the museums at Balboa Park, the Hotel del Coronado and the marketplace in Old Town while staying cool. It’s also great because you can split this tour up over two days if you wish; many folks do because there is so much to see. This museum is home to the world’s oldest vessel that is still sailing, The Star of India. You can take a tour, walk on the deck, and learn about the history of this amazing ship. The museum has numerous interesting temporary and permanent exhibits that showcase the maritime history of San Diego. It’s a great activity for adults and children. Located in La Jolla, about 25 minutes from San Diego, this unique aquarium gets you out of the heat and under the ocean! Interactive exhibits feature more than 60 different habitats of Pacific marine life. There are exhibits featuring seahorses, coral displays, living tide pools, a shark reef, a giant kelp forest tank filled with marine animals, a hall of fish that showcases numerous sea species from the Pacific Northwest all the way to the waters of Mexico and the Caribbean and more. A wonderful way to stay cool in San Diego and spend the day – the Birch Aquarium is perfect for kids and adults of all ages. The USS Midway is the longest serving US aircraft carrier and is now a floating museum. It’s located at the Navy Pier and is something the whole family can enjoy. There are 60 exhibits and you can tour the sleeping quarters, the ship’s jail, the flight control deck and more. Self-guided tours are available in various languages, and there are many docents onboard as well as retired World War II pilots who enjoy sharing their knowledge of the vessel with guests. Okay, so it’s not indoors, but how cool is a beachfront amusement park? This one’s got it all – giant roller coasters, thrilling rides, bumper cars, wave pools, laser tag, arcade games, mini golf and much more. There’s even food, shopping and various activities and events happening throughout the year. Belmont Park is an exhilarating way to spend the day, and the park has rides and activities for little kids, big kids and adults too.
. When you’re in San Diego in the summertime and you’re looking to beat the heat, you’ve got many options. 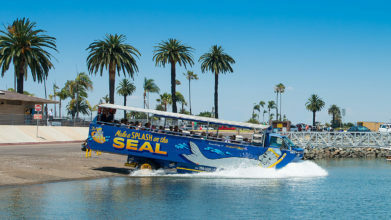 So after you hit the beach and spend a few hours walking through the San Diego Zoo, book your seat on the Old Town Trolley or head to a museum for cool things to do!